Like every military family, mine is well acquainted with the separation and loss that come from the demands of military life. As the Lord has transitioned us from one place to another, from one assignment to the next, we have experienced the privilege of connecting in community with many different people, as well as the frequently sad task of saying goodbye. Military families regularly live far removed from familiar surroundings, far from relatives and old friends, surrounded by new cultures and unfamiliar faces. At times, the military life can feel a lot like a revolving door of changing faces and places. It can be easy to feel lonely in these new surroundings, despite being surrounded by a myriad of people. To combat this tendency towards loneliness and take advantage of our limited time in any particular place, my family has found it best to jump right in and get connected: to embrace our new community and intentionally invest in new relationships. We are practitioners and advocates of exploration, immersion, and connection. Jesus and the apostle Paul both modeled this well and it’s the heart of the New Testament church. We were created for community. God, who Himself resides in community, never meant for us to go through life disconnected from those around us. In fact, though Jesus at times sought out solitude far from the bustling noise of ministry, He most frequently surrounded himself with those with whom He had created community and family. “And his mother and his brothers came, and standing outside they sent to him and called him. And a crowd was sitting around him, and they said to him, “Your mother and your brothers are outside, seeking you.” And he answered them, “Who are my mother and my brothers?” And looking about at those who sat around him, he said, “Here are my mother and my brothers! For whoever does the will of God, he is my brother and sister and mother” (Mark 3:31-35). Jesus’ implication is that we are more deeply connected by a common mission and heart, than by our lineage or DNA. Jesus, in effect, said we canchoose our family. Jesus’ words bring to mind Proverbs 18:24, “A man of many companions may come to ruin, but there is a friend who sticks closer than a brother.” To Jesus, the tie that binds is in the heart—not in the blood. While we cannot always be around those whom we love and are related to, we can usually connect with other believers around a common love and mission. Paul tells us that we are all a part of one body—a community that functions together as force multipliers to accomplish what no one person could ever do on their own (Ephesians 3:6, 4:25). The Bible says that the Lord goes before us wherever we go (John 10:4, Deuteronomy 1:30). Before we arrive in a new location or situation, He has already been there—prepping the battlefield for our arrival. As we transition we are like a well-planned invasion; our task is to connect in community and be a part of what God is already doing in this new place. When God moves you on to your next assignment you may not feel as though the current mission is fully complete and you will likely mourn the loss of cherished relationships. Don’t worry if the tasks or ministry work in your last assignment seem unfinished. Jesus did not heal everyone or meet every need before moving on to the next place. His timing is greater than our timing (Isaiah 40:31) and His ways our higher than our ways (Isaiah 55:8-9). Jesus, Paul, and the proliferation of the New Testament church demonstrate that the life of a Jesus­-follower is dynamic and often on the move. When God is moving your heart or your feet, rest assured that it is precisely because thisis the right time and He has something for you to do in this new place. What that something is, He must reveal; rest assured, it will involve and necessitate community. Community is His plan to care for and empower His people. We were created for community. 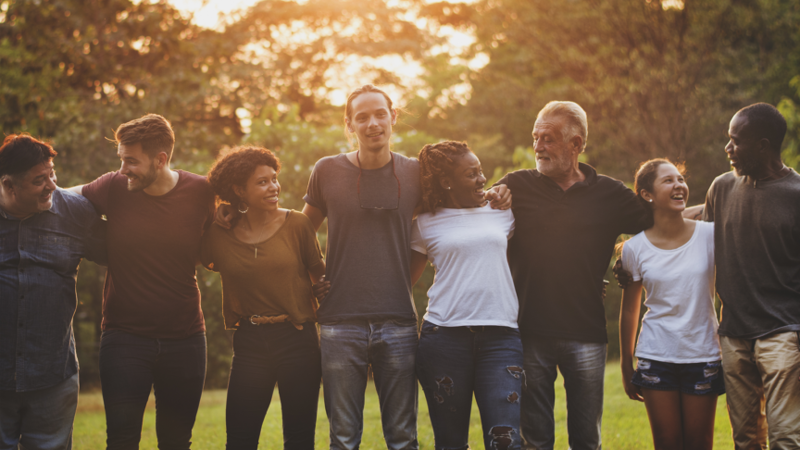 Our real family is the group of people we connect with through love, shared vision, and a common mission—not necessarily those to whom we are related. The military understands community. Community is the new family.